Just a quick post tonight. It's 11pm here and I told myself I'd be in bed by midnight. I need to get some sleep I have a bunch of errands to do tomorrow that will probably take up my entire day unfortunately. These are my Thanksgiving Dinner invites to 5 of our friends we're having over for Thanksgiving dinner this year. I'll come back tomorrow to add in details. 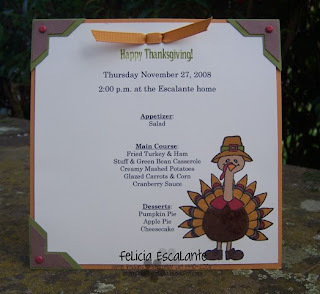 This is such a cute Thanksgiving invite, who would come after receiving this!